Wondering how to naturally get rid of ants in your house? 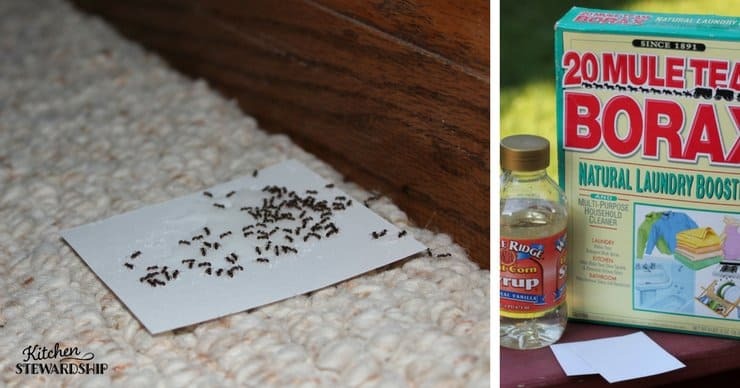 A homemade natural insecticidal spray for hand-to-hand combat, a homemade ant trap to catch them all, and various “lines ants won’t cross” to keep them out or contained are all found here! No toxic or expensive ingredients! I killed 50 ants today in 10 minutes. Turns out that spilled sugar and a sticky molasses jar attracts ants like…well, like spilled sugar and a sticky puddle of molasses! The microwave cabinet where I keep my sweeteners (since I don’t use a microwave anymore) was taken over by ants, the little kind that don’t even feel gross when you smash them with a fingertip. Even the 2-year-old got in on the fiesta and has a kill shot to her name. Before we could eat, I also sprayed down the entire unit and all along the baseboards of the kitchen, especially in front of the slider (where I know the ants get in the house) with my homemade natural insecticidal spray. I’m a big fan of natural remedies and am even learning to make my own herbal treatments for the medicine cabinet. I’m not going to put out poison in my kitchen (unless the ants and earwigs take over completely). My mom copied this recipe down out of something she was reading once at my house, and I am sure glad I was able to find it last week when the ants first came marching in. Imagine my glee when not only ants but earwigs, too, my most hated nemesis that hide in every washcloth and towel in our house, died within 60 seconds of being squirted. Mix in a spray bottle. Spray on any soft-bodied insect that invades your house or garden: ants, earwigs, aphids, whiteflies, mealy bugs, etc. Also spray a barricade line where ants might be entering your house. The only drawback is that it doesn’t work once it’s dried, so if you really want prevention, you have to spray often throughout the day or use other strategies below. This is a good first wave of terror on the bug world, though. If an initial on-contact kill with the spray doesn’t get rid of all your ants, you need to give them something poisonous to take home to their friends. Cut an index card in half. Mix about a 1:1 ratio of corn syrup (or any sticky sweetener) and borax (one major reason I won’t use a homemade dishwasher detergent made of borax). I just use a spoon or my finger and do it right on the card; then I don’t have any ant poison dishes to wash. Put the index card where you know they’ll find it, even on carpet (see above). Check out my non-toxic ant poison video to see how SIMPLE it is to make this stuff – it takes 45 seconds! Note: the sweetener will dry out in a day or two, so when the ants stop feasting, replenish with new sweet poison to make sure they are really gone. I’m honored to be part of the Herbs & Essential Oils Super Bundle ofcomplete eCourses, eBooks & printables. It is designed to give you the skills and confidence to use herbs & essential oils for staying healthy, supporting the body in illness, non-toxic cleaning, beauty & relaxation, and more…available NOW for less than the cost of a co-pay! try food grade diatomaceous earth, found on Amazon, sprinkled around the exterior of the house or even inside as a line ants can’t cross. Squirt the ants with undiluted vinegar. 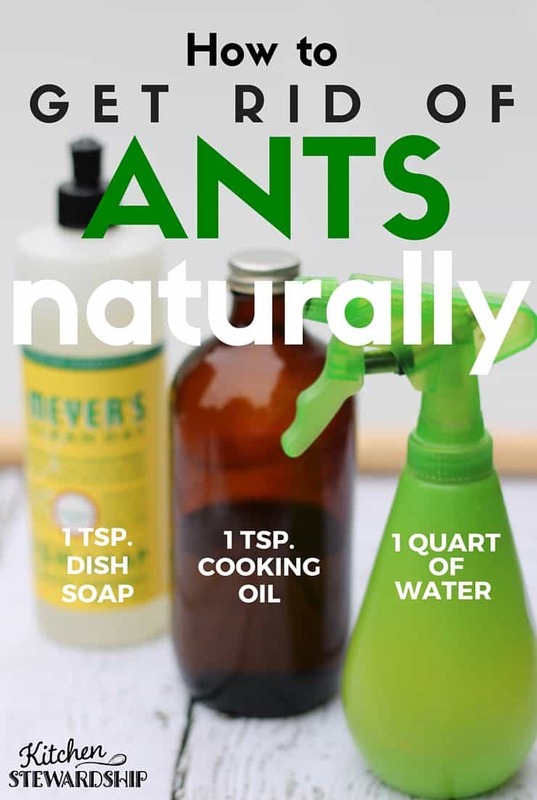 My friend Heather has such a great post with SEVEN natural ways to kill ants in the house! For me, the homemade insecticidal soap is the most effective thing I’ve ever seen to kill ants on contact. If you happen to have a bees’ nest (or more likely, a wasps’ nest), check out our method for getting rid of a wasp nest. Aren’t I lucky? Along with our friends the little black ants and the terrifyingly pervasive earwigs, we also have been bombarded with fruit flies in the past 24 hours. I absolutely understand how primitive (and not so primitive) peoples in history assumed the fruits like melons were actually full of fruit flies. It’s incredible how quickly they appeared en masse after I cut a cantaloupe! If you’re as lucky as me, you might want to read my post on How to Naturally Get Rid of Fruit Flies in your House. 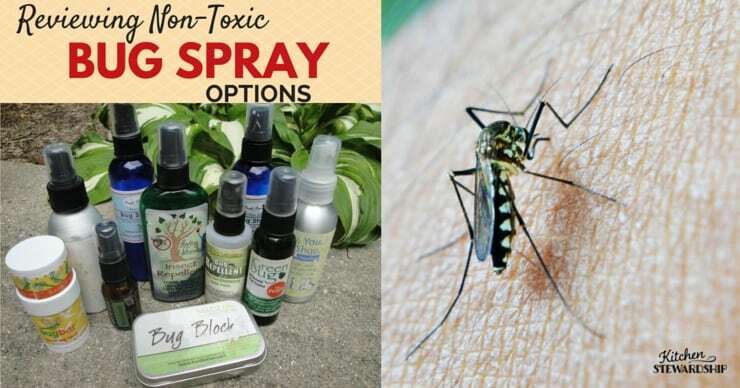 Got you covered there too with our big non-toxic bug spray review…and for the scarier bugs, you’ll want this breakdown of insect repellents and how safe they are compared to the risk of Lyme and West Nile. Don’t miss How to Naturally Control Bugs in the Garden. And if you need a snack after all that insect fighting, check out the 30+ recipes in Healthy Snacks to Go. I wish my apartment had the tiny ants, instead we got carpenter ants (with that gross feeling when you squish them too)! I’m going to try the vinegar or the soap/EVOO/water mixture and see if that helps. .-= Jessica´s last blog ..Trip To DC =-. Borax and water will work on carpenter ants and all ants except fire ants. Mix just about a teaspoon of both together. I put it in a flat plastic milk cap or a metal beer bottle cap. I have actually put it directly on the counter. It won’t hurt but if it dries out to much it can take some work to get off. Anyway mix up new if it dries out. At first you will think you have done the wrong thing because there will be a lot more ants than you thought possible. But after two to three days all of them will be gone. They take it back to their next and feed it to all the family including the queen. You can use this outside also but if you put it in a rain protected area be sure and put it in the cap. Otherwise it dries to concrete hardness and really takes some scrubbing to get off. I messed up. I did not mean Borax and water I meant Borax and any kind of liquid sweetener such as corn syrup, maple syrup or cane syrup. Indeed that is a way of ridding ants. Make sure the queen dies and the whole colony dies with her. However I discovered there are other methods with far less killing, which worked for me which I´d like to share. I had ants last summer, I got a bad flat and suddenly one day ants came crawling through my wooden floor! At thirst I thought some ants somehow got through an open window, until I discovered the nishes in the floor from which they came. I instantly killed the first batch completely(which was a mistake I later realized). Then I tried closing the nishes with gypsum and straying cinammon lines to repel them. None of this worked, they only kept coming from other nishes or just went past the cinammon lines, they would simply crawl under my carpet to avoid the cinammon. Ants are social insects, they use mainly pheromones and other chemicals to communicate, close by each other they can also communicate via sound, but not on long distances, for long distances they use pheromones and other smelling agents. Thats why ants also always follow ant trails. 1 ant leaves a trail marking it with pheromones, the other ants follow this trail by scent(also note that ants are either blind or have a very bad sight unlike many other insects. Therefore theyre noses and sensing organs are very sharp). Ants tend to communicate a lot, they also tell each others about good hunting or gathering spots, bad ones to. This is where you can make use of theyre social behaviour. You must deprive the ants from all food in your hose, and make theyre stay a misery which they wont forget, which they will surely tell the other ants to. Damage some ants(dont kill them) and make sure they crawl back to theyre colony. They will tell the other ants what happened to them. Also while your at it you can kill a few ants to(but never kill all! If you kill them all they cant tell the other ants what happened, always let at least 1 ant alive and let it crawl back to the colony). Also place theyre dead bodies in front of theyre colony. The other ants trying to crawl in your house will notice them and be more prone to avoid your house. Or: Catch some ants, stray some cinammon on them(they will hate this) and put them back to theyre colony, they will instantly crawl back, totally desorientated. However it wont kill them, and its effective to scare them off your house. Also stray some cinnamon lines in the corners of your house, in front of theyre colony entrances and eventually the kitchen(or other “food spots”‘) to. Ants hate the smell of cinammon, and it also helps them loose theyre orientation and make it hard for them to spray pheromones and lay theyre ant tracks. Also in spring/summer/autumn get yourself some mediteranian spice plants. They are very effective repellents agents all sorts of insects, ants to. Against ants especially thyme, rosemarry and majoran are the most effective. Basil for example can also be used against ants, but basil is more effective against flies, fruit flies and mosquitos. They are cheap and easy to grow, you can get them in nearly every supermarket in summer. They only need plenty of water especially on hot, sunny days. They can be placed on any window in the house and tolerate a lot, except dryness as I said. And they will provide you with fresh spices, ideal for things like salads, breads, pasta, pizzas, meat, fish etc. Setting up mediteranean plants will effectively help to repell ants(other insects to) and make it harder for them to orientate and lay pheromones. And most important of all: ALWAYS make sure there is absolutely NO FOOD for them available! Ants enter your house in search of food. The reason they enter is because they promise themselves lots of good food spots in your house. If they wont find any food(but predators/death instead) they will leave your house automatically over time. As I said ants communicate, they tell each other about good food spots. If there isnt any food in your house and many die or come back damaged, they will automatically leave your house alone in some time and go outside for better food and hunting spots. Do this and the ants should go away, worked for me at least. It only takes a few days and a bit of patience, just follow the above steps. It worked well for me, in fact my grandma already got some poisoned food trap for the ants, and I was about using it when they suddenly stopped apearing and never came back. I still got the food trap stored somewhere lol. Im glad I didnt have to use it in the end, because that would have killed the queen and the entire colony. And remember that ants also are very important for our eco system. Damaging them etc. may sound cruel, but to me killing an entire colony via poisining is far crueler. This way only a few individuals die, other suffer some damage, but the rest of the colony can live on, you dont need any chemicals or poison, and you get your peace in the end. By the way this works with moths to, without the cinammon of course. Moths like ants, once you got them in your house and they found food, will always tend to come back again and again. Simply killing the moths did no good, they kept coming again and again for 2 years. So one day I made the effort to catch 1 moth with a glass container. I tossed and damaged it a bit, and then threw the moth out of my window. I did the same with another moth that came in later. Since then, no more moths entered my house. And im glad I finally got my peace and quiet and dont have to kill them all the time. Haha this is awesome. Next time I find an ant in the house I’m just going to cripple it and then put it outside while saying,”Send your people a message, “Stat out of my house.” Then I’ll feel badass for the rest of the day. i love your method of scaring them without wiping them out. I think ants are good to have on the outside. I can’t prove it but i think they keep the roaches at bay. I like to think they each roach eggs. Cripple, Maim, and Injure Ants to deter them. I’ve been using this method for ages, but only more recently started wondering if there were others out there who had stumbled upon this, albeit cruel?, method. Obviously, you still need to ensure you’re not leaving food out for them, and cleaning those chemical trails is key too, but I have routinely allowed those ants who survive a foot-stomp to limp back out the way they came (originally to try assessing where they were originating from) and would find that the following day, the ants simply disappeared. Granted, it didn’t keep them out permanently — especially when you have sloppy pets who leave bits of food all around their dishes — but it has has been somewhat remarkable, to go from a minor infestation, with ants crawling all over your kitchen surfaces, to being unable to spot a single one the next day. Coincidence? I have no idea, except to say that in my experience it’s been a very long string of coincidences. If you can handle ant brutality, and leaving a bunch of ants dead and writhing around on your floor for a day, I would give this method a try, if at least to corroborate or disprove the theory. Also keep in mind that I have only used this method on larger black ants. I’ve had issues with those tiny, tiny brown (paharaoh?) ants, and while I may one day attempt to try the “injure method” with… some tweezers and a magnifying lens? …the only effective method to date has been to simply keep things clean, which of course, is a good practice to maintain, ants or no ants. I use borax and icing sugar. The icing sugar coats the borax and the ants take it back to their nest. Or so I was told. It does work. .-= Wendy´s last blog ..Don’t Ask When I’m Having Kids =-. What a timely post! Our kitchen has been taken over by fruit flies and our patio by ants. I can’t wait to get home and try your home-made insect spray! .-= Hollie´s last blog .. =-. Another thing that you might try is putting out a tray of baking soda mixed with icing sugar along the pathway they are using to enter and exit your home. The icing sugar attracts the ants, but because ants have formic acid in their bodies (which they use as a defense mechanism) the baking soda combines with the the acid and they die. They also seem to then write off our home as a danger site and I don’t have ants following the same path in again. We had horrible ants in California and found a mix of peppermint oil (the pure essential oil) and water worked wonders. We killed them with it, then sprayed it to remove their scent trail. Best thing I did, though, was to find where they were coming in at and caulk the opening closed. After a year, we had that apt tight…now our new place, it’s working here too. The other thing that works more long term…Diatomaceous earth. I put that stuff down in my house where the ants were coming in and they are just gone and stay gone. I do that after I clean up with the peppermint. It’s natural, safe for my pets and me and really lasts. It works really well on hardwood floors too – just put it down, use a broom to push it into the grooves and then sweep up the excess. Works on most of these soft bodied pests I find. I’ve used peppermint oil too. This is a big wine making area, and in the fall when there are piles of pressed grapes the fruit flies are thick! Will this work on pests in the garden too? Will is harm plants? I’m not sure why insects make me all squirmy, but I am glad I stumbled upon this post! Thanks! .-= Robin´s last blog ..Food for Thought =-. Thanks for the good info! I can’t enjoy bugs as much as some. “Tis the season. This is one time I usually just buy. Terro brand ant poison is the syrup & borax stuff, you can buy it ready-made in a bottle or already in little bait containers, and it works WELL. And it’s easy to find. I’ve use the syrup and borax combo with success on sugar ants. It takes a few days to work b/c first the ants have a feeding frenzy, but they take the borax back to the nest which is poisonous so it’s a more thorough extermination than just killing indoors. .-= Jennifer Bruining Parenting in Blue Jeans´s last blog ..Giveaway- Powder Pouch =-. My husband has gotten some bites on his legs and noticed spiders in his shoes and in our towels. Could it be the earwigs. If they are spiders, what natural way can we get rid of them? I wish I knew the answer to that one! I read that spiders taste through their feet and hate certain essential oils such as lemon and peppermint. You can mix an e.o., water and disposal to make a natural spider repellent. Spray around places in your home where you see them and around areas where they come in. That should be dish soap, not disposal! Autocorrect….aggravating! .-= Condo Blues´s last blog ..Please Make Lisa Nelsen-Woods the First Salada Green Tea Spokesperson- =-. I had read, years ago, that Windex & the like killed ants. When i changed to natural products, i found my water/vinegar (& sometimes Thieves’ Oil cleaner) will kill them every bit as quickly as ammonia-based products. We tried the ant trap with sweet/borax (inside something where our cats couldn’t get to it) with mixed results. What worked best last year was a line of Diatomaceous earth (DE) all around the house. DE is not harmful for pets or people (it is used in gardening) but it is crystalline & cuts up the ants. I’ve a feeling we didn’t put a thick enough line around the house this year because they are getting in, but this is one thing for which they can’t develop an immunity. The little ants aren’t gross to kill with your fingers, but i find that they have a weird, nasty smell to them. .-= Kathryn´s last blog ..Brief =-. Great tips! Do you have any for getting rid of house flies? We are experiencing an invasion the likes of which I’ve never seen. My husband is killing 10-15 flies every day, and it doesn’t matter how clean the kitchen is. They ignore the fly strips and only a few have landed in the trap outside. The only thing we’ve found is to squirt them with water THEN smack them with the fly swatter- the water makes it harder for them to fly. I also need help with flies, we just built a new house and it is terrible its hard to sleep they buzz your head all night. We live about 2 to 4 miles from a chicken building, they pile chicken poop in the fields around us, but they don’t drop it off til at least 9 at night and drop it off all night never in the day the county came out here they said it was the trees, but that’s not true because my family has lived here for aleast 100 years. we grew up here and NEVER had them this bad need help. Need help! I use apple cider vinegar in jar with a narrow neck. Actually it’s a ceramic vase that originally held those scented reeds. The scent was just too strong and perfumy, so I got rid of it and now use the vase. It captures them easily and they can’t get out. I rinse and refill weekly. I do essentially the same thing with a squirt of dish soap. I had a terrible ex-roommate who somehow infested our kitchen with houseflies after only a month, and this worked worlds better than fly paper or chasing them with a swatter! YES, finally I can help!!!! lol My neighbor man told me this tip. Use a spray bottle, add a squirt or pump of liquid dish detergent (I think liquid hand soap works too). Fill the rest of the way with water. The soap blocks their body ‘openings or breathing areas’. Just spray them, even in the air and they nearly drop on the spot!! This works for wasps, bees, most bugs, ants….I use it for everything and if they don’t drop dead on the spot, it will only take mins. Take a soda bottle and remove the lid. Cut the bottle in two, with the top part slightly shorter than the bottom part. Pour about a teaspoon of yeast in and then add a sweet liquid such as fruit juice in the bottom part to a depth of about an inch or two. Add one drop of liquid detergent to break the surface tension of the liquid. (I read orange or red Kool Aid w/sugar really attracts more which I am going to try). Then, invert the top of the bottle into the bottom, forming a funnel leading into the bottle. 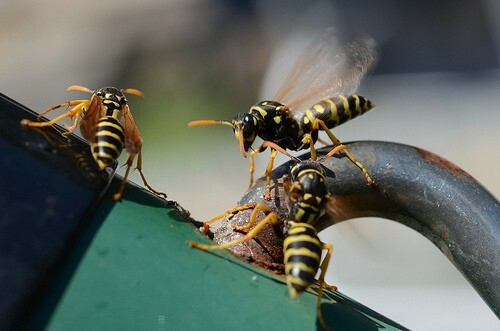 Flies and other flying things such as yellow jackets will be attracted and they will drown or get trapped. It lasts about a week and it will catch a lot. I understand meat works better for flies but this worked very well for them and for mosquitoes. I have used these both indoors and out with very good success. Also it works with a two liter bottle and the smaller single serving and one liter size. Good luck. I need to get mine made soon as the yellow jackets will appear soon. Flies or fruit flies can be a damn nuisance as well. 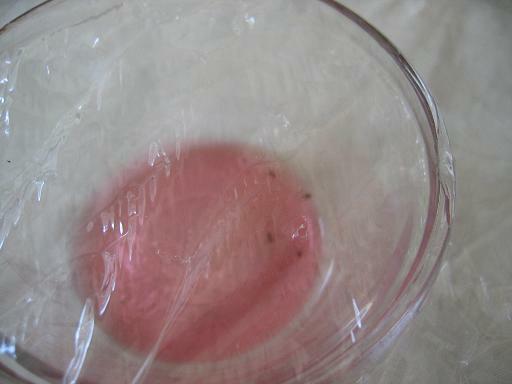 I had them(fruit flies) to in the summers of 2010 and especially worst in 2011. I for myself am not entirely sure why they stopped appearing since 2012(im glad anyways). I tried many fruit flie traps, chemical ones with poisoned food as well as natural traps. They always killed maximum of 80 to 90% of the population. But the rest 10 to 20% of the flies would live on, ignore the traps, breed, and in a few days the would be back again on mass…. Even disposing of the garbage every 3-4days can bring no results. (Fruit fly eggs need 6-7 days to hatch, and a further 1-2 days for the larva to be adult flies, thats why consequentally disposing of the garbage every 3-4 days can be effective against fruit flies and in some cases solved the problem). However fruit flies dont need garbage to survive. Those nasty beasts can lay theyre eggs even in sinks or really any damp and humid place. They can easily use nishes in your sinkholes to lay theyre eggs, or any other damp place. If you take out the garbage all 3-4 days and leave no food for them, the main population will sink of course. But again a small majority of them will survive and be a nuisance all the time. Even with the garbage method at least 10-20% will surive somehow. Dont ask me how but they are quite the survival acrobats, dont underestimate fruit flies. Fruit flies live only about 45 to 60 days. In that time they can go up to 14 days without any food, they only need water to survive up to 14 days, and they can get this water easily by your sinkholes in your house anytime. They can lay eggs even in spots without any nutrition, a few will hatch and somehow survive to reproduce. And also: Fruit flies may be social creatures, but they dont seem to follow pheromones and scents like ants or moths do. If stressed ants or moths leave pheromones and scents to communicate and warn others. Bees and wasps do this to by the way. However flies dont do this, even fruit flies dont, despite theyre very own kind of social behaviour. In theyre case its based on pure instinct, toughness and a very good reproduction rate. They use pheromones only for mating. Fruit flies like all flies mainly depend on theyre sharp eyes and sensing organs to orientate. However flies also have quite good noses, which they use for scenting and finding food spots. But they dont produce scents themselves, except for mating, and in rare cases repelling predators to by producing bad smelling agents. Only a few flie species do this though. However I know how hard it is to get rid of fruit flies. What worked best for me: setting up meditaranean plants. Like I said earlier most insects hate the essential oils in most plants, therefore many other plants with essential oils like the pine tree or lavender work to. Btw. lavender is said to be extremely effective against ants. However lavender is not so easy to grow, with a garden its easy, in a pot its hard. They not only dislike the smell, but the intense smell also disturbs theyre orientation. Its automatically harder for insects to locate any attractive food spots via smelling. Against flies and mosquitos of all sorts especially basil is very effective. Oregano is quite effective against flies to. The other herbs thyme, majoram, rosemarry, oregano and also lavender are effective to, but mainly against ants and silverfishes and stuff like that. You can also use essential oils, but keep in mind that the evaporete quickly and the effect is short. Which is why plants naturally producing essential oils are far more effective and cheaper in the long term. However for me plenty of basil, thyme and majoram did it to get rid of the fruit flies. Of course I continued to dispose of the garbage all 3-4days. The number of them shrunk more and more over time. After about 2-3weeks the fruit flies where gone. And It was still an extremely hot and humid late summer, ideal for them to breed, still none of them would enter my house. However since that summer 2011 the fruit flies stopped to appear, only moths and mosquitos kept reappearing. And later last summer the ant invasion started. Finally this year the moths have stopped appearing to, only a few mosquitos still come in here… I slapped one a few hours ago. However my oppinion: Plants containing essential oils are the best and most effective way to get rid of at least the majority of most insects. Even if they come into your house, there will be far less of them, again about only 10-20% will enter your house. If you have a garden which I dont have, you can also plant lots of lavender, meditarenean spices or lemongrass etc(lemongrass is said to be highly effective against all sorts of mosquitos, never tested lemongrass myself though). Also tomatoes, potatoes, daturas or brugmansias and all other night shaders are effective against especially mosquitos to. Nighshaders contain a huge variety of alkaloids, and a few of them are responsible for the typical smell of the those plants, most insects hate those alkaloids and the smell, as it is highly toxic to most of them. Only a few insects have adapted an immunity to alkaloids and can eat or tolerate night shaders. However, any plant of the nighshader family can be used as an effective repellent against insects. And if you have a large garden with plenty of space and a moth problem, you might consider planting a walnut tree. Walnut trees give of a very special scent, which we humans cant even detect, most insects cant as well. However moths can detect this scent, and its extremely effective against moths. Moths will go nowhere near a mature walnut tree. However it wont work on most other insects, the walnut tree doesnt give off essential oils but theyre own smelling agents. Highly effective against moths, and if I remember correctly earwigs to. However highly effective against certain insects, but totally effectless against the rest. From my own tests this worked best against fruit flies but overall also other insects to. Even moquitos come in far less numbers. Combine some plants with essential oils and the mentioned killing methods. Overall extremely cheap, free from any chemicals or poisons, and it brought the best results for me. From my experience you get the best resuls when combining plants against several types of insects. This will result in practically any unwanted insect to avoid your house. Only mosqutos keep reappearing. If anyone has a super effective repelling agent for mosquitos share please. I still havent found an effective way to repell all mosquitos from my house. Wow! It was great to see this post. I had an invasion of ants yesterday in my kitchen. We have had problems with them off and on. I’ve tried some of those other remedies. They just don’t work for us. I will try this one next. I get the feeling our house is sitting on a giant anthill. We used to have a HUUUUGE problem with ants. My parents did something last year… some guy came and it probably had to do with chemicals and so they never came back. This year they came back early, then went away and now we do not have many… very weird as no one came to stop them! If we get a lot of ants again then I will have to try out your methods! When you have several they can get super annoying! And, we got the carpenter ants! We have fruit flies too… not too much of a problem though for me. .-= Primal Toad´s last blog ..Primal-Paleo Smoothie Recipes =-. If that’s the same as a drain fly I poured orange oil down the drains and never saw them again. It was with ants that we taught our two year old not to go in the street. He killed so many of them, that he understood, that if he went in the street, he would get squished like an ant. I found that just cleaning my floors constantly with vinegar really helped with keeping the ants away. Even kept my husband out of the kitchen (sadly) for a little while. .-= Kris´s last blog ..Chilled Avocado-Tomatillo Soup pp 25-26- A Diptych =-. A much needed post right now in our house. Thanks for this! .-= Melodie´s last blog ..We Interrupt This Breastfeeding Post… =-. Just linked to this post today on my blog. 🙂 I posted my tips and ideas for dealing with ants and fruit flies in the kitchen. Hope your house is staying insect free these days! I’ve been known, when in a panic, to use masking tape to catch/kill ants or pick up the dead ones! Hi! I am a fan on facebook and this is my first time on your site – I love this post! I try to keep toxins out of our house, too – and these are all such great ideas. Thank you! My first choice when finding them in the house is to kill them with home made cleaner. Vinegar even diluted 50/50 with water will do it. I also use Thieves’ Oil by Young Living with the vinegar, that does it too. To prevent them from coming in the house, we put a line of diatomaceous earth (food grade, you can get it at a feed store, not pool grade) around the house in spring. Works wonders and i notice fewer spiders too. It is safe for people and pets to eat, you don’t want to breathe it. However, we don’t get a lot of rain here. Still, if you know where they are coming in, this does an awesome, safe job of killing little critters. I’ve heard splenda works like a charm, they actually stumbled on splenda while they were trying to make an insecticide. Now THAT’S a comforting thought, ugh! Just one more reason to avoid artificial sweeteners. also put vaseline on the cracks or where ever they are coming in. I’ve been using lavendar sachets all over my house and haven’t seen any ants in the 2 years I’ve been using. We also sprayed diatimacious earth under our house the other year after we had a bad summer of ants. I use DE when I need ant control in my gardens. Here in N FL we have all sorts of ants including fire ants. I just found out that I can kill cockroaches with a spray bottle filled with heavily diluted soap. Any soap at all. Once my dad was googling how to sell a home by owner. I told him if he just went over to my blog he could learn all about it. Geeze, doesn’t he pay attention? my dad asked me about blind corner cabinets. i’d done an entire blog on kitchen storage and organization. his response? “I can’t find it.” LOL. And thanks, Dad. Boiling water over the anthills outside (if you can find them) works like a charm. Sugar, water and borax also works for inside. Love this I am going to try it tonight. I have ants bombard my home yearly. Never thought about using the soap water before. having some problems with the ant bait tho, its not mixing well and the Horace is just clumping on the bottom. I made a large batch ( I have a lot of carpenter ants) and the syrup seems to separate. I think I am feeding them and not killing them. What am I doing wrong? Thanks for the tips about the ants; we have a huge problem right now. But please, please, call a beekeeper next time you have a bee problem! The bee population is dwindling and it would be better to try and save them if you can. A beekeeper can safely remove them and place them in their own hives. They will usually do this for free since they benefit from having another hive. Oh, the guilt! You’re totally right, and I never once even thought of “bees, honey” only “bees, STING!” when this was an issue. Shucks. I’m totally writing a post on it sometime and reminding readers this important message! No, it is not. Borax is not very toxic. People use it inside their house and it is widely used. Almost every house pests can be treated using boric acid. What an interesting story. You husband is a brave man with the Bee’s. I would have run. Another thing green dishwashing liquid is good for is to get rid of stubborn stains. But only green (not other colors) dishwashing liquid works for some reason. The best way to get rid of blacks is 1% Ceylon Cinnamon Oil mixed with 99% Water, mixed in a spray bottle. Spray and wipe your kitchen counter tops or any surface full of ants. They will be gone in minutes. You can even spray your fruit bowl and even the fruit with this. It’s safe, nontoxic, child safe and pet friendly. Or yeah you can use it outside too. The best part is Cinnamon Oil smells great, works for weeks at a time and is one of the most powerful natural disinfects you can find. The only thing you must not use more than 1% Cinnamon Oil. Anything more and it might become a skin irritant. All you need is 1% which saves you money anyway. Lightly sprinkle unflavored instant grits around the ant colony, or at least along where you see them crawling if you cannot find their home. The ants will flock to the grits, bring them home and indulge. Eating the grits will cause them to implode and destroy the colony. I HATE ants more than cockroaches! They are horrible. The only thing I fight with more is the raccoons who try to get our chickens and the gophers who eat my plants. My bathroom counter has been covered in cinnamon for a whole week. As soon as I clean it up, the ants are back. Such awesome ideas….does anyone know about wasp nest and to get rid of it? I still swear by just using 1:1 vinegar water to wipe up the “ant trail”. Since I started cleaning with vinegar, I haven’t had another ant in my house (even 5 or so years later!) No special traps or lines….just wipe counters/walls/etc with the solution and they’ll pack their bags and head home. It also deters other bugs and spiders too. I guess they taste with their feet (even after it’s dry), and vinegar is not a pleasant taste for them! I am going to definitely try the vinegar…I am in Jamaica west Indies and so I have ants and spiders galore. FYI I learned about pyrethrin from watching Billy the Exterminator on Netflix. 😉 They use it all the time. We use 1:1 vinegar to clean with, but they still come back. The borax sugar water cocktail works for a while, but they usually come back eventually. It’s a constant battle since I seem to be living on a giant ant hill. They come into every corner of the house and everywhere in between (literally). But I can rarely find where they are coming in at! my sister has a huge horrible ant problem. she finally called in the exterminator a few weeks ago who told her the worst thing you can do is kill an ant as all that does is call more in. …..she still has ants. Prefect timing for this article! !